Another wrinkle has been added to the most important will he/won’t he saga involving a college athlete in quite some time. 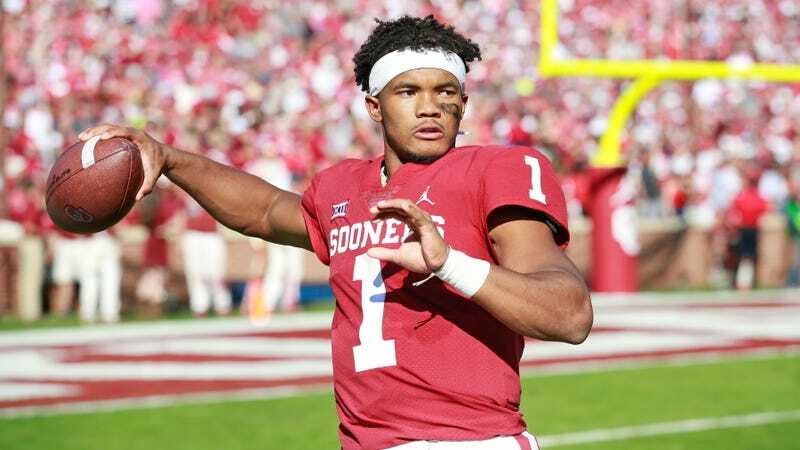 Heisman Trophy winner Kyler Murray is expected to declare for the NFL draft on Sunday, according to a report from the San Francisco Chronicle. The Oakland A’s, who drafted Murray ninth overall in the MLB draft back in June, reportedly are prepared for this decision. Murray’s decision to declare for the draft on its own does not directly affect his $4.66 million deal with the A’s. The only concern, as far as Oakland and whoever ends up selecting Murray in the NFL draft are involved, would be a scheduling conflict between when A’s position players are expected to report to camp (Feb. 15), and the NFL combine (Feb. 26). One could argue that given his skillset, he could skip the combine in favor of attending camp, but all that would do is just string the A’s along for inevitable disappointment as Murray is reportedly leaning towards a future in the NFL. The 21-year-old is certainly in a more uniquely difficult position than his fellow pro-bound collegiate peers—especially since the Bo Jackson/Deion Sanders route would be nearly impossible today. On the one hand, given the relatively shallow talent pool at quarterback in this year’s NFL draft, Murray would almost certainly be a first-round pick with the numbers and tape he’s put up this season alone. Even recently hired Cardinals coach Kliff Kingsbury said back in October that he’d select him first overall (huh!). If he sticks with a football career, he’d have to give back the A’s signing bonus, but would certainly more than make up for it with his new NFL salary along with any other endorsement deals he’d likely earn as a quarterback in America’s most popular league. On the other hand, there are plenty of reasons for him to stick with baseball. Being a top-10 pick, there’s less of a chance that he’d be stuck in the doldrums of the minor league system for very long, and his name alone could bring him up early. He also already has a deal signed with a team, whereas there’s still time for his draft stock to fluctuate among NFL teams. Above all else, there’s the fact that baseball isn’t exactly known for athletes suffering debilitating injuries and diseases as a result of playing the sport for many years. This decision will ultimately come down to whatever Murray defines as his best interest because he has the talent to not just succeed, but excel in whichever sport he chooses. Does he want the better starting salary and stardom that comes with being a quarterback in the NFL; or does he want the safer, more relatively stable life in the MLB the might require him to wait a bit before truly breaking out? Whatever he chooses, it certainly won’t be as easy as some people make it out to be.